I've had firework pushpops on the brain since last summer when I ran out of time to make them amidst the craziness of moving. Unfortunately, a few months ago I saw this idea by Betty Crocker, so I had to accept the reality that I won't go down in history as the inventor of the firework push pop. There's probably billions in that. However, while their pops are cute, they weren't exactly what I had imagined. Fireworks need pointy cones on top and streamers coming out the bottom! I kept their color scheme and added some extras and I am happy with how they turned out. Unrelated- My kids are going to think it's bizarre when they start school and realize all their friends don't have holiday-themed treats packed in their lunchboxes weeks before the actual holiday. I baked my batter in cupcakes according to package directions (12 blue/12 red) but you can also bake them in two 9x13" pans. Since you are halving the batter you will have to play with the baking time a little, but a great general rule is- when you start to smell what is baking... it's nearly done. Allow cakes or cupcakes to cool completely. This is important! Overnight is great. 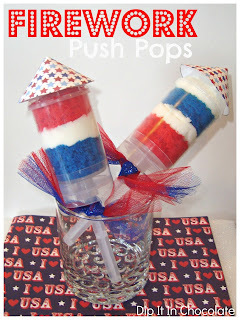 Tie tulle around the bottom of each pushpop and top with a festive cone. Have a super happy Fourth of July!! Very cute. I do not know how you do it. Blogging, cooking, and so much more. Where do you get the push pop containers?